Check if your chosen name is available..
Great news! Your chosen name is available. Scroll down to select a formation package. Protect your home address with a London Registered Office Address on Regent Street or Kensington High Street. All Companies House and HMRC mail will be forwarded to an address of your choice free of charge (within the UK). Looking for assistance forming a UK company from overseas? We can assist you with a virtual address, mail forwarding, registering for local taxes and staying on top of your annual filing duties. Forming a limited company is simple using our online company formation wizard. When you complete each area the corresponding tab will light up green. Don’t worry if you haven’t got all the information to hand, we automatically save as you go along. Once your company is registered (usually within 3-6 working hours) we will email you your certificate of incorporation and the memorandum and articles. Whatever you need for your new startup The Company Formation Wizard can help you out. 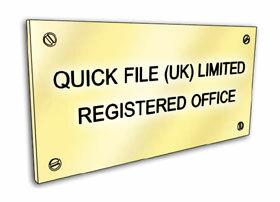 We provide company seals, name plates, template packs and statutory registers. We work alongside Barclays to help you setup a business bank account. We can also provide you with a free online accounting system through our sister company Quick File. Need to register for taxes? No problem, we can assist you with VAT Registration as well as Payroll and Corporation Tax. Forming a limited company in 3 easy steps! The Company Wizard online application breaks down the company formation process into 3 easy steps. Complete our online application. We'll save the information you enter as you go along so you can return later should you need to gather more information. If you need assistance or have any questions, feel free to call us and we'll be more than happy to assist you. When you complete each section it will light up green. When you're ready to submit your application you can make a secure online payment, we will then send your application electronically to Companies House. Typically it will take around 3-6 working hours to complete the company formation process. We will then email you a PDF of your incorporation certificate along with your Articles of Association. If you'd like to see a preview of the company registration process in more detail take a look here. To find out what you will need before you get started take a look at our FAQ here. What Do Start-Ups Wish They Had Changed? Starting a business can be an exciting time, but making some decisions without much thought can cause a few problems. What Is Home Business Insurance, Do I Need It? If you're running a business from home, you may not have the correct insurance. Home Business Insurance may be needed to protect you and your business. Starting your own business can seem a little daunting and a complicated process when you're on the outside, looking in. So, what should you consider?